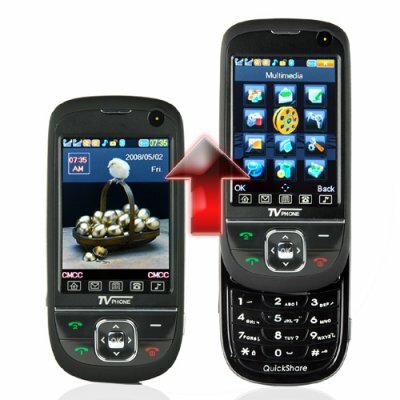 Successfully Added QuickSlide Quad Band Dual SIM Cell Phone + TV and Bluetooth to your Shopping Cart. QuickSlide Quad Band Dual SIM Cell Phone + TV and Bluetooth is a compact, easy to use phone with powerful functions: analog TV receiver, FM radio, digital video camera, highly responsive touchscreen and much more. Do you want to use two phone numbers at the same time? Do you need a phone that will work anywhere in the world? Do you wish you could watch TV or listen to the radio anywhere, anytime? Do you dream about having all of these features without needing a suitcase just to carry them around? Get your hands on the quad band, dual SIM M28 QuickSlide and make your dreams come true! With dual SIM and dual standby, the M28 "QuickSlide" lets you have two active phone numbers at the same time on a quad band phone that works all over the world. Just pop your SIM cards into this completely unlocked mobile phone, turn it on, and start calling! Making calls and sending messages from either SIM card is easy. You will never have to restart your phone just to switch SIM cards again. You expect a lot from your phone, and the M28 QuickSlide delivers. The QuickSlide lets you take videos and pictures, play music and videos, and enjoy analog TV and FM radio wherever you go. Pair with Bluetooth devices for the convenience of handsfree calling. You can even personalize your phonebook by assigning pictures, music, and videos to your contacts and contact groups. Great functions packed into a compact design are made even more attractive by Chinavasion's wholesale price and no minimum order quantity (MOQ). Buy more to save more, and don't forget to check out Chinavasion's large selection of Bluetooth devices to enjoy handsfree calling with the M28. The M28 QuickSlide mobile phone is brought to you by your best choice for high quality, low price electronics, Chinavasion. Complete convenience: Dual SIM, dual standby, and Bluetooth for handsfree dialing anywhere you go. Messaging: SMS, MMS, voice mail server, broadcast message. Phonebook: Store 500 contacts on phone and more on TF card. Special Calling Features: Auto redial, speed dial, call time reminder, auto quick end, and and assign pictures, music, and videos to individual contacts or caller groups. Does this phone have any other languages? The phone comes with all the languages listed in the description above. If you plan to order a large quantity (25+ pieces), then we may be able to supply this model with your choice of language(s). Contact us to check. Does the M28 come with a digital TV tuner as well? No, this model only comes with an analog TV tuner. Does the analog TV tuner work in South America? Yes, you will be able to receive analog TV channels where ever you are, whether in South America or anywhere else in the world that broadcasts TV on an analog signal. Does the phone come with a prepaid SIM card or contract? The phone does not come with a prepaid card. The phone is contract-free, it is fully unlocked so it can work with any GSM service provider you choose. Bellissimo cellulare, con menù in italiano il più bello fin'ora avuto tra le mani, piccolissimo e con menù italiano tradotto alla lettera. on 2009-11-24 16:10:59 I am asolutely, delighted to have this phone. I received my phone yesterday morning and I'll say that, I'm very happy with the Machine. Outstanding customer service, fast delivery, only took four working days from Chinavasion to the United Kingdom through Fedex Courier. This phone is a good value for money. Promise to do business with chinavasion again. Many thanks! very good mobile phone - 5 Stars . arived in 3 weeks to Romania with normal post. Recieved phone within 4 working days all the way to New Zealand. Great phone does so much it'll take till Christmas to work it all out, but so far so good. Works on the telecom xt network as well. For tv to work in New Zealand set to Europe. Well worth the money. Only thing I don't like is theres no 3.5mm jack .